From the greatest chants to brand new pieces, we lift the lid on the best music associated with the beautiful game ahead of the FIFA World Cup 2018. Opera? At a football match? Before July 7 1990, it might have been unthinkable – but this date changed the world of sport (and classical music) forever. When the three rival singers Plácido Domingo, José Carreras and Luciano Pavarotti joined forces to perform at a charity concert in Italy, their recital – particularly the emotionally charged 'Nessun Dorma' – touched the hearts of millions and propelled Puccini's aria into the pop charts, alongside such timeless classics as U Can't Touch This by MC Hammer. The group, known from then onwards as The Three Tenors, were an instant hit, and went on to perform at the World Cup in 1994, 1998 and 2002. Any piece that combines the spirit of Freddie Mercury's 'We Are The Champions' with Handel's rousing Zadok the Priest is a fitting football anthem as far as we're concerned. Turns out UEFA share our view, after commissioning Royal College of Music graduate Tony Britten to write a piece in the style of Handel, with suitably 'champions'-based lyrics in English, French and German. Granted, Handel might've done a better job of Google translating the hilarious text, but there's nothing that can't be cured with a generous helping of football-fuelled enthusiasm. Compositional inspiration is unlikely to strike while you're leafing through the sports pages in the local rag. Unless, of course, you're a musically inclined football fan by the name of Edward Elgar. 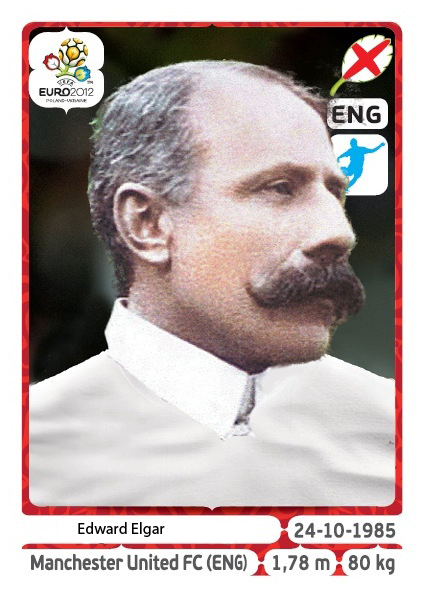 After seeing the words "He banged the leather for goal" in a match report in 1898, he was so moved by the phrasing that he set the lyrics to music - creating the first football chant written by a great composer. The song didn't exactly catch on and has never been recorded... although Wolves fans can be regularly heard singing strains from Nimrod at matches instead. Football meets opera once again in this vigorous work by Shostakovich. It's a thrilling tale of international rivalries being smoothed over by a mutual love of sports - and there's even a musical football match in the second act. Clapping, cheering and singing all form the basis for this modern football chant by David Lang, inspired by an Arsenal match in the 1990s. Although it's somewhat more tuneful than a 60,000-strong stadium choir of vocal football fans (and probably slightly less beer-fuelled), this piece for 1000 voices attempts to capture the huge range of collective and individual emotions behind being in a crowd. It was only a matter of time before the footballing world caught on to this cracking tune by the great Italian composer, Verdi, and made it their own. The lyrics, however, may have been lost in translation; if you've ever heard Derby County's sweary tribute to Fabrizio Ravanelli you'll know what we're talking about. If you're looking for serious choral music with a hearty pinch of salt, look no further than Poulenc's dazzling Gloria. You can almost see the glint in the flamboyant French composer's eye as he packs his religious masterwork with colourful jazz chords and cheeky irregular rhythms - all inspired, so Poulenc said, by the sight of some serious-looking monks enjoying an aggressive game of footie. If the reviews are to be believed, the name is about the only clever thing about this football-inspired piece of minimalist music, composed in just under three weeks during the 2002 World Cup. But football-loving Nyman doesn't stop there: after a lifetime of supporting Queen's Park Rangers, he was inspired to create an entire album of football related pieces titled After Extra Time - and acting as a fitting tribute to the Juventus fans killed at the Heysel stadium in 1985.